Came across this interesting article by Gaurav Dalmia, published in the Times of India. India’s contradictions perplex tourists, sociologists, businessmen and politicians alike. The country has 131 dollar billionaires currently. Mumbai ranks as the world’s 12th richest city, more prosperous than Paris or Frankfurt. At the same time, in a country where 65% of the population is dependent on the farm economy, on average 37 farmers have committed suicide every day over the past two decades. The last, certainly, is a scary figure. Suzuki’s Indian subsidiary, valued at $44 billion, is a proxy for India’s booming middle class. Yet, Healthcare Access and Quality Index ranks India a dismal 154th amongst 195 countries, worse than Sri Lanka or Bangladesh. Balance sheets of India’s banks show that Indian consumers are better credit customers than Indian businessmen.Net non-recoverable debt for the corporate segment is four times that for the consumer segment. It is not surprising that HDFC Bank, which had the insight to focus on the consumer segment, has reached the number 3 slot in India’s market-cap league tables with a valuation of $88 billion, within two and a half decades since inception. It is 10% less valuable than the 149-year old Goldman Sachs and larger than icons like ING Bank, Credit Suisse and Deutsche. Similar inconsistencies are prevalent in the political arena. India’s GDP per capita is $1860. Bihar’s is $525 and Goa’s is $4156. That’s almost an eightfold difference. As a result, challenges of these states are vastly different. Bihar’s bete noire is law and order, Goa’s is work ethic. Bihar’s two big challenges are unemployment and rural electrification. Goa’s are in-migration and related integration problems. A World Bank report shows that in Bihar people want more government handouts and better delivery mechanisms. In Goa, people seek less government and less corruption! This Goa-Bihar contrast is a subset of the larger trend of India’s south and west breaking away from their northern and eastern peers along most dimensions of development. Given these stark differences, it’s often difficult for politicians and constituents from one part of India to appreciate the perspectives from a different region and form a holistic view. Such multiple realities are the result of uneven economic and social development. History shows that values are conditioned by economic realities. Farming led to nomadic tribes settling down and creating scale that resulted in the first civilisations, with which came ethnic loyalties, organised religion, and monarchies. The advent of industry induced new forms of political organisation, the variants of democracy, communism and fascism that we see today. The information age shifted society one step further towards liberalism and globalisation. We are moving towards what futurist Rita King has called The Imagination Age, where more value is added by imagination and creativity than knowledge and analysis, evidenced by the entertainment industry top ladder making as much as the business elite. And this era is marked by individuality and multiple identities. One can see all of these trends simultaneously – and in large numbers – in current-day India. Each transition has the same challenge: the previous era’s thinking lingers because individuals are hard wired with evolutionary instincts of the past. Today, different groups of people are in different transitions. 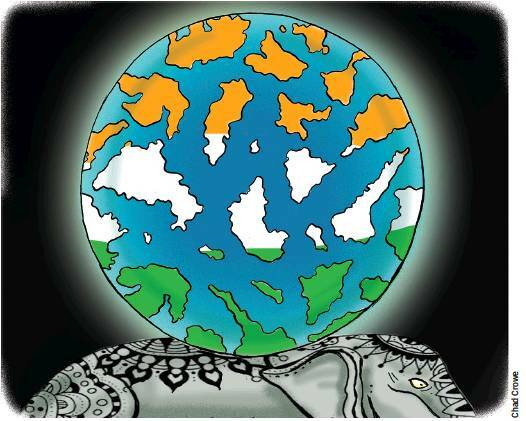 Narratives that one attributes to different parts of the world are playing out in India in parallel. Think of tribal affiliations in Syria. Much of India’s caste politics resembles that. Think of middle America’s economic woes. Uttar Pradesh has a similar undercurrent of autarky and a mind-set favouring protectionism. Think about Africa’s resource curse. Much of India’s Naxalite problem, which afflicts 104 out of India’s 707 districts, has a similar script. Think of Theresa May’s maybe moments with Brexit and Angela Merkel’s see-sawing approval ratings. India’s political leaders routinely face the same phenomena and electoral anti-incumbency in India is amongst the highest in the world. Think Putin’s successful self-aggrandisement with appeals to nationalism. India’s political leaders are frequently worshipped and almost all political parties find a market for selling nationalism. The parallels need not only be negative. Think of China’s thriving middle class. Millions of Indians are crossing that threshold every year. Think pragmatic materialism of New York or Hong Kong. It’s much the same in Mumbai and Delhi. Think innovation and Silicon Valley. India has its own vibrant entrepreneurial class and ten dynamic Unicorns. These simultaneous multiple transitions are posing complex leadership challenges. As we have seen elsewhere in the world, the elite are somewhat disconnected with the majority, because they are in a different transition. Additionally, the best solutions do not fall into neatly defined boxes of any ism. Indeed, they would often appear conflicting. Therefore, over-reliance on ideology will not carry the day. Focussed implementation will. Here, leaders normally look for consensus. Given India’s complexities, they might look for passion instead. Leaders will have to embrace what will appear to be zero sum games in the short term. And overcome the impulse to “rather be ruined by praise than saved by criticism”. India’s roller coaster is not for the faint-hearted leader. The writer is Chairman of Dalmia Group Holdings.